It's the official last What I'm Wearing Now post of winter, which is kind of thrilling for me. I won't waste your time gushing about how much I prefer spring and summer fashion to fall and winter, because you've heard more than enough of that around here over the years. It was actually unseasonably warm here last week, which prompted me to pull some pieces from the back of my closet that are admittedly not quite weather appropriate and prance around in them in public like it makes perfect sense to wear a short gauzy dress (like this one with which I am absolutely smitten and wear constantly but couldn't find a photo of that worked in the collage above) in February in Chicago. But hey - it was in 30s again this weekend and I wanted to have a little fun while I could, man. As you can see, most of what I've been wearing this month can still be considered cool weather attire, but I'm starting to mix in warmer weather pieces like this dress. 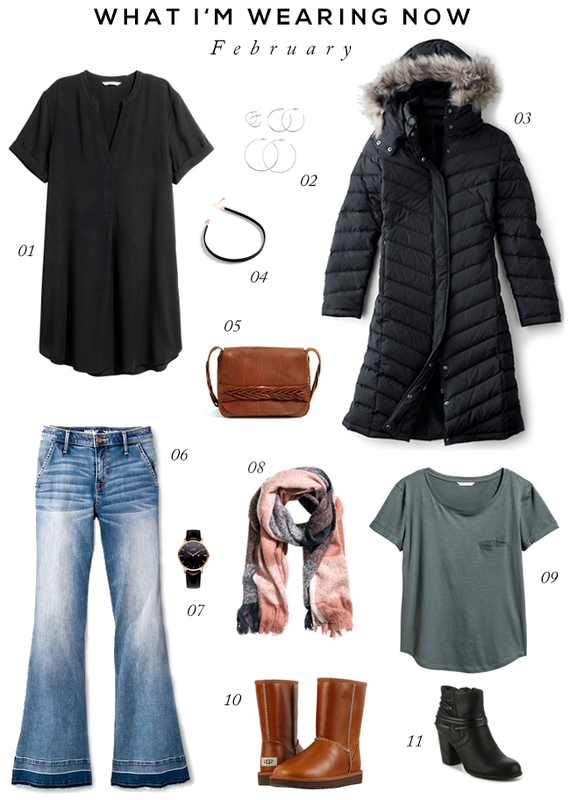 (A kiss on the hand may be quite continental, but layers are a girl's best friend.) We've been lucky (at least in my opinion) not to have any snow on the ground at all this month, which means I've been able to rock the flared jeans (which are on clearance for $14.98 right now!). I also picked up these booties at the end of January and have been wearing them nonstop - I think they'll look amazing with cut off shorts and short dresses in the spring. And this coat, which I wasn't even sure was my style when I first got it, has been a daily wear as well. I'll be kind of sad to say goodbye to it for the season soon - and I never feel sad about putting away winter clothes. Last month I told you were we taking our annual late winter trip to Arizona at the end of this month, but because of work schedules we're pushing it to early April. So there won't be any bikinis in next month's edition either, but I'm crossing my fingers there will be more of those gauzy dresses to share. Love that black dress and those booties! I love everything you've been wearing as usual! Lucky you for having a bit of warm weather this February! Currently it's mostly cold and rainy over here, so that beautiful scarf you picked wouldn't go amiss!